Home Posts tagged "philosophy of technology"
ABSTRACT: The widespread application of Industry 4.0 technologies relating to social robotics, embodied AI, the Internet of Things (IoT), ubiquitous computing, and advanced human computer interfaces is giving rise to a growing range of “cyber-physical” entities. 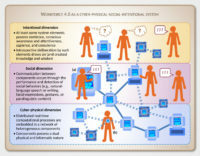 By building on established definitions and analyses of the cyber-physical system, cyber-physical-social system, cyber-physical society, and cyber-physical-social-thinking space, this text formulates a conceptual framework for understanding the emerging “Workforce 4.0” as a specialized type of “cyber-physical-social-intentional system.” Attention is given to the heterogeneous agency, technological posthumanization, functional decentralization, and planned architectures or spontaneously self-organizing topologies manifested by Workforce 4.0. It is shown how such a workforce is situated within the context of cyber-physical space, a cyber-physical organization, cyber-physical ecosystems, a cyber-physical society, and the larger cyber-physical world. ABSTRACT: The processes of “posthumanization” can be understood as those dynamics by which a human organization or society comes to include members other than “natural” biological human beings who contribute to the structure, activities, or meaning of that organization or society. In the world of business, such posthumanization is commonly identified with the growing use of social robots, autonomous AI, and joint human-computer systems to perform work that in earlier eras would have been performed by human beings acting alone. Such “technological” posthumanization is often presented as a new phenomenon occurring largely in those developed economies that are pioneering Industry 4.0 paradigms (e.g., by expanding workplace automation) and that are uniquely positioned to harness such forces to drive economic growth. Here, however, we contend that such emphasis on the novelty of technological posthumanization overlooks forms of non-technological posthumanization that have been at work in human societies for millennia. Such dynamics of non-technological posthumanization have weakened significantly in many developed economies since the mid-20th century; however, they remain relatively strong in emerging economies. In this study, a conceptual framework is developed for identifying and comparing phenomena through which processes of technological or non-technological posthumanization manifest themselves in developed and emerging economies. It is argued that the ongoing and robust experience with non-technological posthumanization possessed by many of the world’s emerging economies may offer them unique and underappreciated psychological, social, and cultural mechanisms for integrating effectively into their enterprises, organizations, and institutions those novel forms of non-human agency that are at work in key Industry 4.0 technologies, like those relating to social robotics, autonomous AI, and advanced human-computer interfaces. ABSTRACT: Here the concept of the human being as a “relatively isolated system” developed in Ingarden’s later phenomenology is adapted into an “aesthetics of isolation” that complements conventional environmental aesthetics. Such an aesthetics of isolation is especially relevant, given the growing “aesthetic overload” brought about by ubiquitous computing and new forms of art and aesthetic experience such as those involving virtual reality, interactive online performance art, and artificial creativity. Key organizational decisions made by sapient AIs. The pressure to undergo neuroprosthetic augmentation in order to compete with genetically enhanced coworkers. A corporate headquarters that exists only in cyberspace as a persistent virtual world. A project team whose members interact socially as online avatars without knowing or caring whether fellow team members are human beings or robots. Futurologists’ visions of the dawning age of ‘posthumanized’ organizations range from the disquieting to the exhilarating. Which of these visions are compatible with our best current understanding of the capacities and the limits of human intelligence, physiology, and sociality? And what can posthumanist thought reveal about the forces of technologization that are transforming how we collaborate with one another – and with ever more sophisticated artificial agents and systems – to achieve shared goals? This book develops new insights into the evolving nature of intelligent agency and collaboration by applying the post-anthropocentric and post-dualistic methodologies of posthumanism to the fields of organizational theory and management. Building on a comprehensive typology of posthumanism, an emerging ‘organizational posthumanism’ is described which makes sense of the dynamics of technological posthumanization that are reshaping the members, personnel structures, information systems, processes, physical and virtual spaces, and external environments available to organizations. Conceptual frameworks and analytical tools are formulated for use in diagnosing and guiding the ongoing convergence in the capacities of human and artificial actors that is being spurred by novel technologies relating to human augmentation, synthetic agency, and digital-physical ecosystems. As the first systematic investigation of these topics, this text will be of interest to scholars and students of posthumanism and management and to management practitioners who must grapple on a daily basis with the forces of technologization that are increasingly powerful drivers of organizational change. A Phenomenological Analysis of the Virtual World as Aesthetic Object: Echo, Deepening, or Dissolution of the Lifeworld? ABSTRACT: In this work we build on the ontological and aesthetic frameworks formulated by Roman Ingarden to develop a phenomenological analysis of the virtual world as aesthetic object. First, ‘virtual reality technology’ is distinguished from ‘virtual environments’ and ‘virtual worlds.’ The types of immersive, interactive virtual worlds accessed through contemporary VR technologies are further distinguished from the types of ‘virtual worlds’ accessed, e.g., by reading a novel or watching a film. Essential and optional elements of virtual worlds are identified, with special attention given to the (software-enforced) ‘laws of nature’ governing the structure and dynamics of elements in a world, the pseudo-natural origins of apparently ‘natural’ elements like wild animals and geographic formations, and the unique positions of the world’s designer(s) and human visitor(s). The potential ‘incompleteness’ of virtual architectural structures and inability to determine whether one’s social interactions are with human or artificial agents is analyzed in light of Ingarden’s interpretation of Husserl’s phenomenological model of intentionality and the perception of objects. It is shown that a virtual building, e.g., does not display all the features of a real-world building but instead possesses some characteristics found in real-world paintings. Drawing on Ingarden’s framework, the (physical) ontic basis of a virtual world is distinguished from the (purely intentional) virtual world as a work of art that is grasped through perception and the related aesthetic and cultural objects that may be constituted by a visitor who undergoes the right sort of conscious experience. The stratification of a virtual world as a work of art is also investigated. Building on Ingarden’s critique of Husserl’s concept of the ‘lifeworld’ as the natural world that is simultaneously (a) stripped of modern scientific theory and (b) the world that we live in and manipulate, it is suggested that VR-facilitated virtual worlds (like other highly technologized forms of art) undermine the factual possibility for such a lifeworld to exist. In response, though, Patočka’s notion (influenced by Ingarden) of fictional literary worlds as ‘echoes’ of the lifeworld is noted; we thus close by raising the question of whether certain virtual worlds might potentially be employed to help restore the possibility of (perhaps temporarily) establishing a Husserlian lifeworld. ABSTRACT: Previous works exploring the challenges of ensuring information security for neuroprosthetic devices and their users have typically built on the traditional InfoSec concept of the “CIA Triad” of confidentiality, integrity, and availability. However, we argue that the CIA Triad provides an increasingly inadequate foundation for envisioning information security for neuroprostheses, insofar as it presumes that (1) any computational systems to be secured are merely instruments for expressing their human users’ agency, and (2) computing devices are conceptually and practically separable from their users. Drawing on contemporary philosophy of technology and philosophical and critical posthumanist analysis, we contend that futuristic neuroprostheses could conceivably violate these basic InfoSec presumptions, insofar as (1) they may alter or supplant their users’ biological agency rather than simply supporting it, and (2) they may structurally and functionally fuse with their users to create qualitatively novel “posthumanized” human-machine systems that cannot be secured as though they were conventional computing devices. 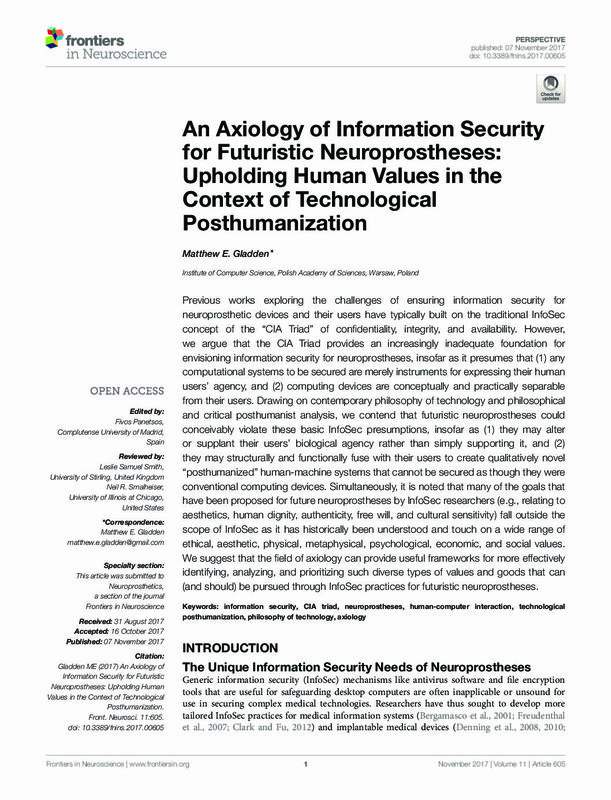 Simultaneously, it is noted that many of the goals that have been proposed for future neuroprostheses by InfoSec researchers (e.g., relating to aesthetics, human dignity, authenticity, free will, and cultural sensitivity) fall outside the scope of InfoSec as it has historically been understood and touch on a wide range of ethical, aesthetic, physical, metaphysical, psychological, economic, and social values. We suggest that the field of axiology can provide useful frameworks for more effectively identifying, analyzing, and prioritizing such diverse types of values and goods that can (and should) be pursued through InfoSec practices for futuristic neuroprostheses. ABSTRACT: Much thought has been given to the question of who bears moral and legal responsibility for actions performed by robots. Some argue that responsibility could be attributed to a robot if it possessed human-like autonomy and metavolitionality, and that while such capacities can potentially be possessed by a robot with a single spatially compact body, they cannot be possessed by a spatially disjunct, decentralized collective such as a robotic swarm or network. However, advances in ubiquitous robotics and distributed computing open the door to a new form of robotic entity that possesses a unitary intelligence, despite the fact that its cognitive processes are not confined within a single spatially compact, persistent, identifiable body. Such a “nonlocalizable” robot may possess a body whose myriad components interact with one another at a distance and which is continuously transforming as components join and leave the body. Here we develop an ontology for classifying such robots on the basis of their autonomy, volitionality, and localizability. Using this ontology, we explore the extent to which nonlocalizable robots—including those possessing cognitive abilities that match or exceed those of human beings—can be considered moral and legal actors that are responsible for their own actions. ABSTRACT: A growing range of brain-computer interface (BCI) technologies is being employed for purposes of therapy and human augmentation. While much thought has been given to the ethical implications of such technologies at the ‘macro’ level of social policy and ‘micro’ level of individual users, little attention has been given to the unique ethical issues that arise during the process of incorporating BCIs into eHealth ecosystems. In this text a conceptual framework is developed that enables the operators of eHealth ecosystems to manage the ethical components of such processes in a more comprehensive and systematic way than has previously been possible. The framework’s first axis defines five ethical dimensions that must be successfully addressed by eHealth ecosystems: 1) beneficence; 2) consent; 3) privacy; 4) equity; and 5) liability. The second axis describes five stages of the systems development life cycle (SDLC) process whereby new technology is incorporated into an eHealth ecosystem: 1) analysis and planning; 2) design, development, and acquisition; 3) integration and activation; 4) operation and maintenance; and 5) disposal. Known ethical issues relating to the deployment of BCIs are mapped onto this matrix in order to demonstrate how it can be employed by the managers of eHealth ecosystems as a tool for fulfilling ethical requirements established by regulatory standards or stakeholders’ expectations. Beyond its immediate application in the case of BCIs, we suggest that this framework may also be utilized beneficially when incorporating other innovative forms of information and communications technology (ICT) into eHealth ecosystems. What are the best practices for leading a workforce in which human employees have merged cognitively and physically with electronic information systems and work alongside social robots, artificial life-forms, and self-aware networks that are ‘colleagues’ rather than simply ‘tools’? How does one manage organizational structures and activities that span both actual and virtual worlds? How are the forces of technological posthumanization transforming the theory and practice of management? This volume explores the reality that an organization’s workers, managers, customers, and other stakeholders increasingly comprise a complex network of human agents, artificial agents, and hybrid human-synthetic entities. The first part of the book develops the theoretical foundations of an emerging ‘organizational posthumanism’ and presents conceptual frameworks for understanding and managing the evolving workplace relationship between human and synthetic beings. 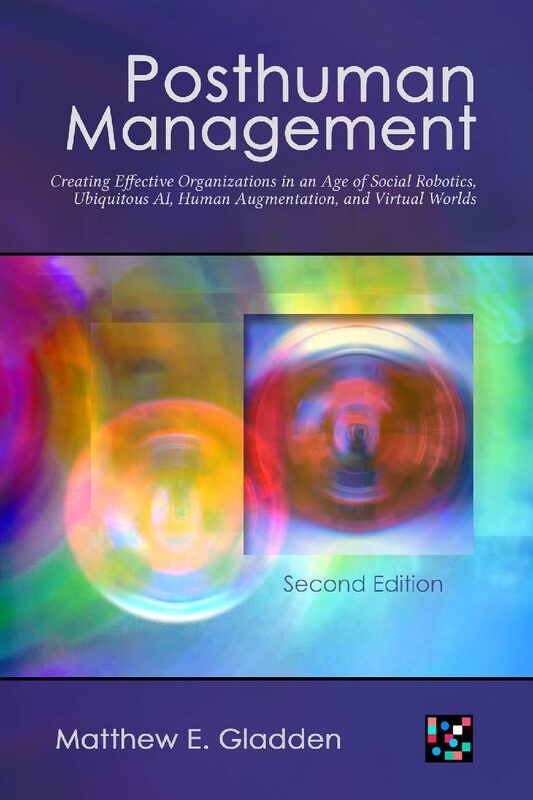 Subsequent chapters investigate concrete management topics such as the likelihood that social robots might utilize charismatic authority to inspire and lead human workers; potential roles of AIs as managers of cross-cultural virtual teams; the ethics and legality of entrusting organizational decision-making to spatially diffuse robots that have no discernible identity or physical form; quantitative approaches to comparing the managerial capabilities of human and artificial agents; the creation of artificial life-forms that function as autonomous enterprises which evolve by competing against human businesses; neural implants as gateways that allow their human users to participate in new forms of organizational life; and the implications of advanced neuroprosthetics for information security and business model design. 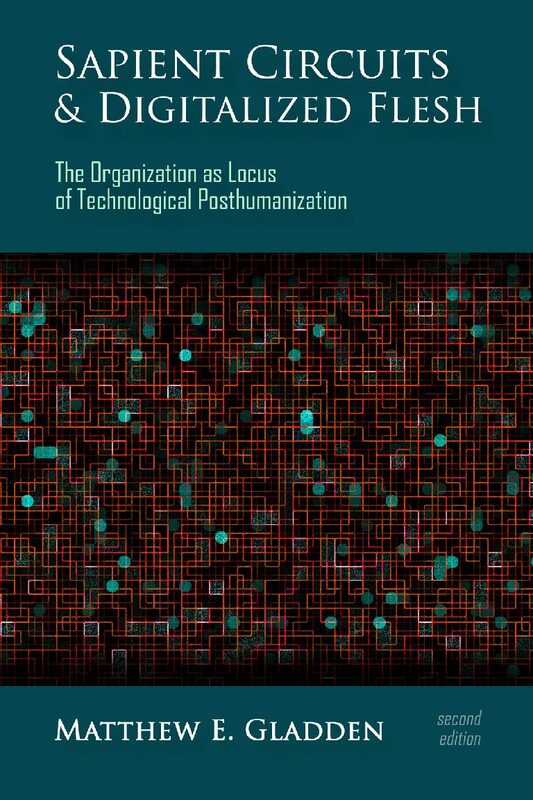 As the first comprehensive application of posthumanist methodologies to the field of management, this volume will be of use to scholars and students of contemporary management and to management practitioners who must increasingly understand and guide the forces of technologization that are rapidly reshaping organizations’ form, dynamics, and societal roles. ABSTRACT: Here we argue that five emerging social and technological trends are creating new possibilities for the instrumentalization (or even “weaponization”) of popular culture for commercial, ideological, political, or military ends and for the development of a posthuman popular culture that is no longer solely produced by or for “humanity” as presently understood. These five trends are the: 1) decentralization of the sources of popular culture, as reflected in the ability of ordinary users to create and upload content that “goes viral” within popular culture, as well as the use of “astroturfing” and paid “troll armies” by corporate or state actors to create the appearance of broad-based grassroots support for particular products, services, actions, or ideologies; 2) centralization of the mechanisms for accessing popular culture, as seen in the role of instruments like Google’s search engine, YouTube, Facebook, Instagram, and Wikipedia in concentrating the distribution channels for cultural products, as well as efforts by state actors to censor social media content perceived as threatening or disruptive; 3) personalization of popular culture, as manifested in the growth of cultural products like computer games that dynamically reconfigure themselves in response to a player’s behavior, thereby creating a different product for each individual that is adapted to a user’s unique experiences, desires, and psychological characteristics; 4) automatization of the creation of products of popular culture, as seen in the automated high-speed generation of webpages, artwork, music, memes, and computer game content by AI systems that could potentially allow venues of popular culture (such as the Internet) to be flooded with content designed to influence a social group in particular ways; and 5) virtualization of the technological systems and mechanisms for creating, transmitting, and experiencing the products of popular culture, as witnessed in the development of all-purpose nodes (such as smartphones) that are capable of handling a full range of cultural products in the form of still images, video, audio, text, and interactive experiences, and the growing digitalization of cultural products that allows them to be more easily manipulated and injected into the popular culture of other states or social groups, bypassing physical and political barriers. While these trends are expected to yield a broad range of positive and negative impacts, we focus on a particular subset of these impacts. Namely, we argue that the convergence of these five trends opens the door for the creation of popular culture that: 1) does not exist in any permanent, tangible physical artifacts but only as a collection of continuously transforming digital data that that is stored on the servers of a few powerful corporate or state actors and is subject to manipulation or degradation as a result of computer viruses, hacking, power outages, or other factors; 2) can be purposefully and effectively engineered using techniques commonly employed within IT management, electronics engineering, marketing, and other disciplines; 3) can become a new kind of weapon and battleground in struggles for military, political, ideological, and commercial superiority on the part of corporate, state, and other actors. In order to stimulate thinking about ways in which these trends might develop, we conclude by considering two fictional near-future worlds – those depicted in Ghost in the Shell: Stand Alone Complex and Transhuman Space: Toxic Memes – in which the further evolution of these five trends is shown as leading to the neurocybernetically facilitated manipulation of popular culture, “memetic warfare,” and related phenomena. We suggest that these fictional works represent examples of self-reflexive futurology: i.e., elements of contemporary popular culture that attempt to anticipate and explore the ways in which future popular culture could be purposefully engineered, instrumentalized, and even weaponized in the service of a diverse array of ends. ABSTRACT: Much has been written about the possibility of human trust in robots. 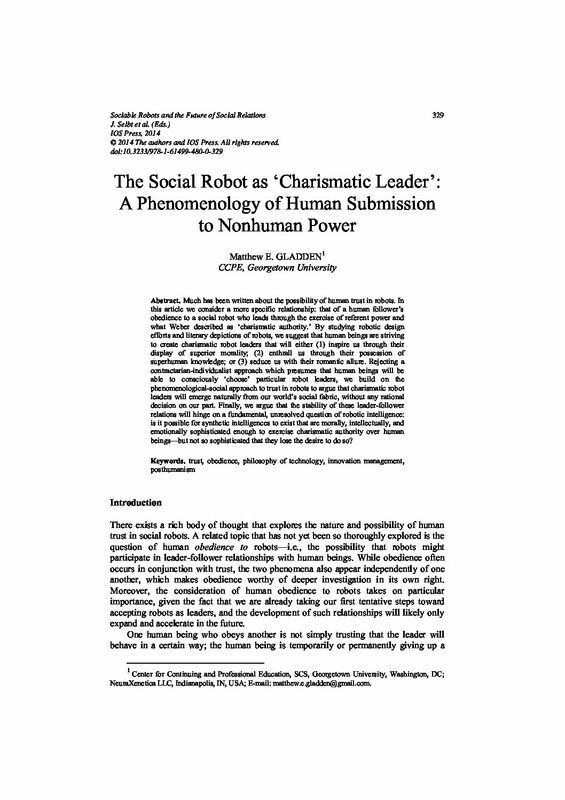 In this article we consider a more specific relationship: that of a human follower’s obedience to a social robot who leads through the exercise of referent power and what Weber described as ‘charismatic authority.’ By studying robotic design efforts and literary depictions of robots, we suggest that human beings are striving to create charismatic robot leaders that will either (1) inspire us through their display of superior morality; (2) enthrall us through their possession of superhuman knowledge; or (3) seduce us with their romantic allure. Rejecting a contractarian-individualist approach which presumes that human beings will be able to consciously ‘choose’ particular robot leaders, we build on the phenomenological-social approach to trust in robots to argue that charismatic robot leaders will emerge naturally from our world’s social fabric, without any rational decision on our part. Finally, we argue that the stability of these leader-follower relations will hinge on a fundamental, unresolved question of robotic intelligence: is it possible for synthetic intelligences to exist that are morally, intellectually, and emotionally sophisticated enough to exercise charismatic authority over human beings—but not so sophisticated that they lose the desire to do so? 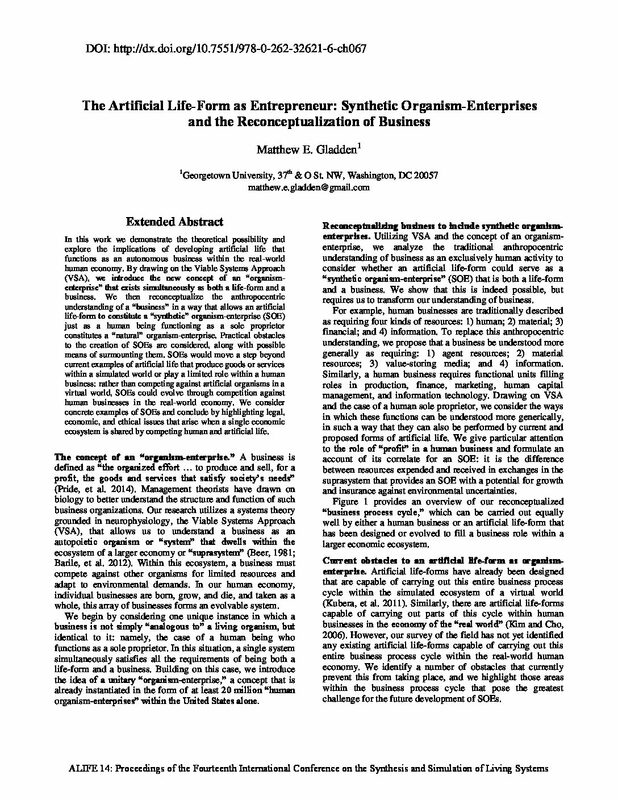 ABSTRACT: In this work we demonstrate the theoretical possibility and explore the implications of developing artificial life that functions as an autonomous business within the real-world human economy. By drawing on the Viable Systems Approach (VSA), we introduce the new concept of an “organism-enterprise” that exists simultaneously as both a life-form and a business. We then reconceptualize the anthropocentric understanding of a “business” in a way that allows an artificial life-form to constitute a “synthetic” organism-enterprise (SOE) just as a human being functioning as a sole proprietor constitutes a “natural” organism-enterprise. Practical obstacles to the creation of SOEs are considered, along with possible means of surmounting them. SOEs would move a step beyond current examples of artificial life that produce goods or services within a simulated world or play a limited role within a human business: rather than competing against artificial organisms in a virtual world, SOEs could evolve through competition against human businesses in the real-world economy. We consider concrete examples of SOEs and conclude by highlighting legal, economic, and ethical issues that arise when a single economic ecosystem is shared by competing human and artificial life. The concept of an “organism-enterprise.” A business is defined as “the organized effort … to produce and sell, for a profit, the goods and services that satisfy society’s needs” (Pride, et al. 2014). Management theorists have drawn on biology to better understand the structure and function of such business organizations. Our research utilizes a systems theory grounded in neurophysiology, the Viable Systems Approach (VSA), that allows us to understand a business as an autopoietic organism or “system” that dwells within the ecosystem of a larger economy or “suprasystem” (Beer, 1981; Barile, et al. 2012). Within this ecosystem, a business must compete against other organisms for limited resources and adapt to environmental demands. In our human economy, individual businesses are born, grow, and die, and taken as a whole, this array of businesses forms an evolvable system. We begin by considering one unique instance in which a business is not simply “analogous to” a living organism, but identical to it: namely, the case of a human being who functions as a sole proprietor. In this situation, a single system simultaneously satisfies all the requirements of being both a life-form and a business. Building on this case, we introduce the idea of a unitary “organism-enterprise,” a concept that is already instantiated in the form of at least 20 million “human organism-enterprises” within the United States alone. Reconceptualizing business to include synthetic organism-enterprises. Utilizing VSA and the concept of an organism-enterprise, we analyze the traditional anthropocentric understanding of business as an exclusively human activity to consider whether an artificial life-form could serve as a “synthetic organism-enterprise” (SOE) that is both a life-form and a business. We show that this is indeed possible, but requires us to transform our understanding of business. For example, human businesses are traditionally described as requiring four kinds of resources: 1) human; 2) material; 3) financial; and 4) information. To replace this anthropocentric understanding, we propose that a business be understood more generally as requiring: 1) agent resources; 2) material resources; 3) value-storing media; and 4) information. Similarly, a human business requires functional units filling roles in production, finance, marketing, human capital management, and information technology. Drawing on VSA and the case of a human sole proprietor, we consider the ways in which these functions can be understood more generically, in such a way that they can also be performed by current and proposed forms of artificial life. We give particular attention to the role of “profit” in a human business and formulate an account of its correlate for an SOE: it is the difference between resources expended and received in exchanges in the suprasystem that provides an SOE with a potential for growth and insurance against environmental uncertainties. Figure 1 provides an overview of our reconceptualized “business process cycle,” which can be carried out equally well by either a human business or an artificial life-form that has been designed or evolved to fill a business role within a larger economic ecosystem.